Like the ideals of most ethnic groups in the country, African American family values reflect many common goals and principles, but also vary according to geographic location, cultural and educational backgrounds and prevailing economic conditions. Before slavery was abolished, African American families were torn apart as parents and children were sold to different people and taken to various geographic areas. Instead of bemoaning their fate, many African Americans vowed to find their lost loved ones and, even before the end of slavery, saved money and made plans to find those they had lost and buy their freedom. The shared treachery of these early families created exceptionally strong emotional bonds that gave them the physical and psychological fortitude to carry on. This separation from blood relatives fostered the practice of designating friends and loved ones as aunts, uncles, nephews and nieces, although they were not technically related; this custom has roots in Africa. To be anointed with such a family title was considered an honor, a testament to the high esteem in which the family held the person receiving the honorary title. The tradition of giving elders in the family the utmost respect was also established during this period, probably due to the fact that the older family members had endured the most indignation. When slavery ended and a sense of newfound independence flowed through the northern states, a sense of pride and respect followed. Multitudes of newly-free African Americans bought land, established businesses and started rebuilding traditional family structures. To gain and maintain equal footing with the predominantly white population, African Americans sought out educational institutions where they could earn degrees to become teachers, doctors, lawyers and other respectable figures. The tenacity and persistence needed to fight for their rights over the next century instilled family values that reflect incredible strength and courage. During the period of slavery, African Americans found strength and unity through communal worship. Many relied on their faith to give them the inspiration they needed to move forward and remind them of the power of kindness and forgiveness, even in the face of the greatest injustice and cruelty. Despite the ignorance and insensitivity of their oppressors, they instilled in their children the values of honesty, integrity and treating their fellow humans with compassion, an attitude that prevails in many modern African American families. Since so many African American families were broken for so many decades, they resurged with a determination to reestablish a strong family presence. Multiple generations frequently lived in the same house and children learned to respect and care for their elders, to practice good manners and to avoid backtalk. Gender roles were blurred as the families worked together to integrate work schedules with childcare and housekeeping. Family ties were strengthened by heavy reliance on parents, children, grandparents and in-laws to provide emotional, financial and psychological support to each other during both good times and bad. Around the 1960s, African American family structures started to change. Social statistics estimated that nearly 80 percent of African American families during the sixties were headed by a husband and wife team. As economic conditions changed and poverty-stricken areas became more rampant in major cities, more African American women earned higher degrees and started working outside the home. This movement precipitated economic and psychological ripples that resulted in many African American families today being headed by one spouse, which could be the mother or the father. As with most societal trends, family values in all cultures are in constant motion; the list of American family values is always evolving. African American families are in all socioeconomic levels, just as every other ethnic group. 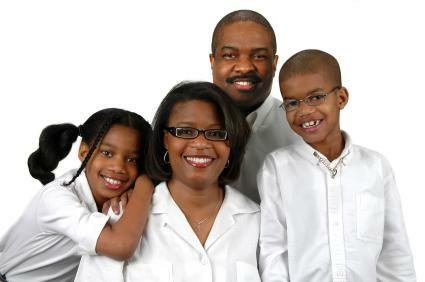 African American family values are as susceptible to the influences of culture, politics and environment as everyone else's, which means these families will most likely experience the same amount of victories, defeats and challenges as other groups, and the importance of family values is likely to stay as strong as ever.